This document was originally released by WikiLeaks. However, there is an error in the file made available by WikiLeaks that causes the document to only display eleven of the total seventeen pages in the document. The version we are making available was created by combining pages from a redacted version made available by the New York Times with the unredacted file from WikiLeaks to create a complete, unredacted seventeen page duplicate of the original document. Page thirteen and sixteen are particularly noteworthy as they list connections with Pakistani intelligence as an indicator of affiliation with terrorist organizations. (S//NF) Below are indicators used in JTF-GTMO detainee assessments to determine a detainee‟s capabilities and intentions to pose a terrorist threat if the detainee were given the opportunity. The indicators are not all-inclusive and are written primarily with the JTF-GTMO detainee in mind, though they can be tailored to other theaters. These indicators are used in assessments in concert with each other, and need to be read in the context in which they are placed within an assessment. While some individual indicators may be sufficient alone to provide an accurate assessment of the detainee‟s threat, others may require additional indicators or multiple occurrences of the same indicator for reliability and confidence. In all, the indicators are designed to point to the threat a detainee would pose if he were to be released from custody, and the intelligence that a detainee potentially possesses, not as evidence to prove a detainee’s guilt or innocence. 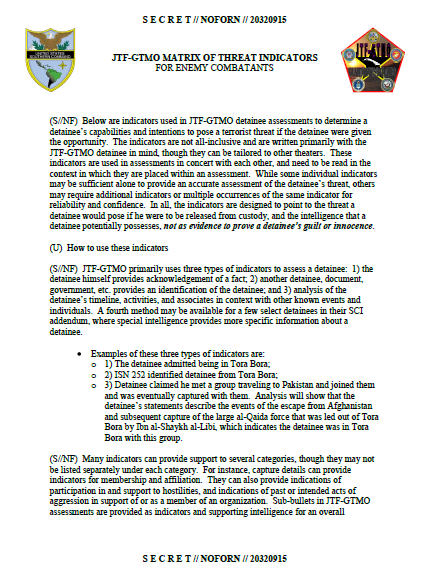 (S//NF) JTF-GTMO primarily uses three types of indicators to assess a detainee: 1) the detainee himself provides acknowledgement of a fact; 2) another detainee, document, government, etc. provides an identification of the detainee; and 3) analysis of the detainee’s timeline, activities, and associates in context with other known events and individuals. A fourth method may be available for a few select detainees in their SCI addendum, where special intelligence provides more specific information about a detainee. 3) Detainee claimed he met a group traveling to Pakistan and joined them and was eventually captured with them. Analysis will show that the detainee’s statements describe the events of the escape from Afghanistan and subsequent capture of the large al-Qaida force that was led out of Tora Bora by Ibn al-Shaykh al-Libi, which indicates the detainee was in Tora Bora with this group. (S//NF) The following provides the primary indicators for assessing a detainee’s membership or affiliation with the Taliban or ACM elements other than al-Qaida. Possessed weapons, explosives, mines, etc.